Kwaidan: Stories and Studies of Strange Things is an excellent source of spooky stories by Lafcadio Hearn. Fans of a movie version saw today's story. Here is an excerpt of Kobayashi's Kwaidan and it specifically shows Earless Hoichi. Hoichi the Earless even has its own Wikipedia article, but most of it is a summary of . . . brace yourself for the longer Japanese name, Mimi-nashi Hoichi. There is, however, a great picture from a theatre production. What I don't care to do is give you a scan from my own copy of the story. Why? I penciled in notes of how I adapt the story. O.k. first of all I confess the librarian in me has a problem with writing in a book. The storyteller in me had two other problems: some of it is too faint to reproduce well and then I also hate to tell people my adaptations are the way to tell the story. Theres a further practical aspect, it's 20 pages long! Does that mean I'm not going to give you Hearn's story? Dunberidiculous! 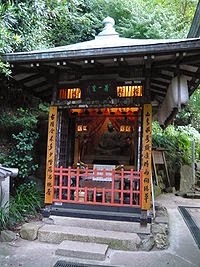 Internet Sacred Text Archive has done an excellent job of posting it and, besides the online version of the entire anthology of Kwaidan, which I definitely recommend, I would send anyone seeking more Japanese folklore also to the Sacred-Texts page on Shinto and Japanese Religions. It is not just religious as it includes not only folklore, but also Public Domain cultural resources and all translated in English. I hope today's segment of Keeping the Public in Public Domain encourages you to try some additional stories too good to be allowed to get dusty in an archive or, worse yet, disappear because nobody reads them. Remember libraries have limited space, so books not borrowed are eventually removed. Librarians use a gardening term, weeding, but it means the book is on its way to oblivion unless it can be added to online resources. Thanks to recent copyright law, many books are a long way from being safely in Public Domain and online collections. That's a rant for another day and I'll try to put my soapbox away.